The opening of The Big Picture covered how writing and drawing prepared me to cope with my father’s dementia and eventual death. I’d built skills to capture my thoughts and feelings and, more importantly, I’d explored myself and strengthened my self-identity. It was almost as if the work I’d done was specifically to prepare myself for that time when I needed it the most. There are times when your thoughts drive your actions in small ways, and there’s time when your habits drive your fate. The more you pay attention to who you want to be, the more you grow towards that end and the readier you are when life presents you with a challenge… or an opportunity. 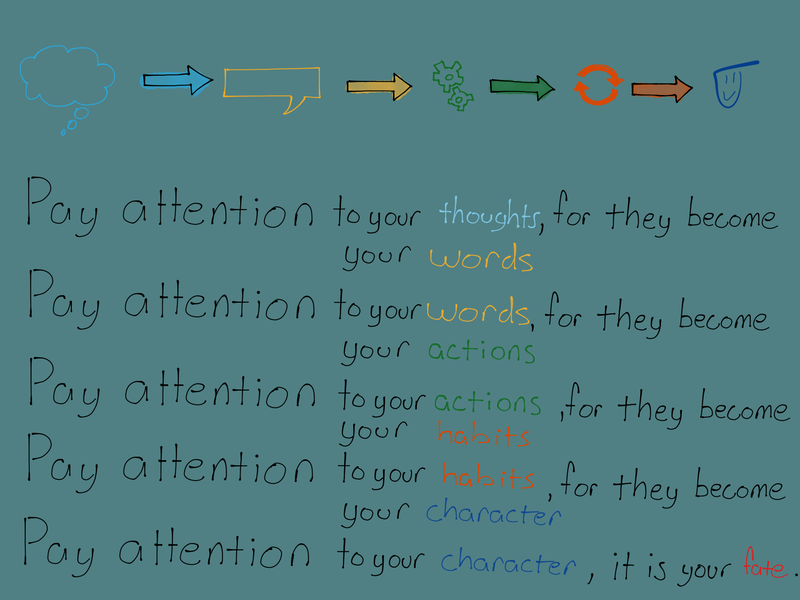 I started blogging to pay attention to my thoughts. A lot of that was personal and it got me used to turning thoughts into words. At some point early on, I also decided to sketch as much of the blog’s visual content as possible. Then I decided to write some articles on LinkedIn and put them on my profile. Some of that was oriented to career goals and skills. Things like managing stress, personal branding, knowing how to manage growth vs. noise in your job, what to focus on in presentations, and the like. Other content was domain-specific – I work in digital marketing and customer experience. As I got better at the visual side, I integrated that into my daily work. I’d sketch out concepts for presentations, build storyboards, and do interactive whiteboarding with my team and customers. All these actions became habits and I became known for doing some unique and engaging work. As it turns out, my growth, skills, and work played directly into my ability to capitalize on a rare opportunity extremely quickly. I got exposure to a fast-moving job opportunity which would be decided within a week. In order to compete, I had to have the usual conversations with stakeholders and then finish with a panel presentation. Because of the nature of the job, that presentation had to explain who I was, my thoughts about the job, show strong awareness of the industry and space I’d cover, and be able to run a meeting with people used to presenting to senior executives in a way that they’d be happy working with me. Oh, and it was a competitive scenario so I couldn’t use presentations I’d given to my customers or anything else confidential. I had a little over a day to get ready, travel, do my day job, and present. Under most circumstances, that would be a daunting sales process – with the product being me. This is where the concept of The Big Picture comes in. All the little work I’d done identifying my strengths, building my skills, developing perspectives, and understanding how to convey ideas all came together like pieces of a puzzle. What would normally be a stressful situation actually became fun. Yes, I had to put the material together, research people I’d present to, and build a personal understanding of the company and how they sell. There was plenty of work, but it happens to be work that I’d actually do for the job itself (which is in sales). In essence, it became the perfect storm for me because I understood very clearly what I needed to do in order to get the offer. If I didn’t come out on top, it was because I was the wrong person for the job, not because of a lack of preparation. It’s true. If you push your boundaries and create regularly, then you’re ready for the unexpected. In case you can’t figure it out, I was able to relax and things went swimmingly. It wasn’t simply a job interview, it was the end product of an amazing amount of work I’d done because I wanted to. It’s very fair to say that those thoughts I’d put in action and built myself on drove my fate. Is there a moral to this story? Always push yourself to do something a little more and keep trying things you like. There are situations where what you do, particularly at work, is tightly dictated. But there are many many others where you can keep expanding and arrive at someplace else entirely (here’s a good book on starting that process). It makes life more interesting and really does prepare yourself for what’s next. Sometimes the Big Picture comes into focus letting you do your best work and smile all the way. I had a friend read this and he suggested tying Part 1 about my father and Part 2 together a bit more. One thing I hadn’t told him is how this week came together. I was out of town on business for the opening part of job interview week and was returning Thursday morning. Dress for my meetings was jeans and sneakers (not all executives wear suits) and that wouldn’t do for my Friday interview. So I flew back to Atlanta, my hometown, and had my son drive by and drop off things I’d need. In addition to a suit, I had him bring a Rolex my father had given me (my brother has an identical one). I didn’t do this to be flashy or project an image as much as to channel him somewhat. He was a salesman and liked to talk about “bidness”. I know he’d love talking about it all and be proud.